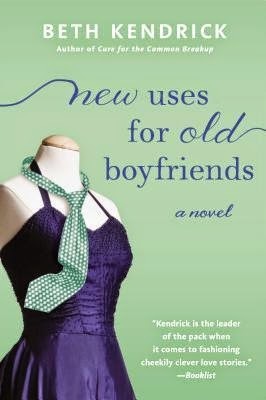 New Uses for Old Boyfriends was fun and though somewhat predictable I still enjoyed it! There was something endearing about Lila and her relationship with her mother. Full of improbable characters and situations, I read this one quickly. Most of the story revolves around trying to save the family home and while I found Lila's mother frustrating at times she played her part well and did eventually pull herself out of the muck and get her head on straight. The source of the possible funds comes from mountains of couture her mother has been saving since her days as a model. I liked that we were given a bit of fashion history through the story- just enough for my unfashionable brain to handle. There were a cast of quirky characters to help Lila and her mother move into the future and I loved that the romantic aspects of the novel were not entirely predictable. Lila's love interest in the end was a great fit and I adored his multiple personality facets- definitely not your typical leading man. The small town lead itself to people getting into each other's business so to open a shop meant a lot of interference and opinion from others but I liked that aspect of the story. My reservations came from the fact that there may have been a few too many people involved that didn't get a conclusion of their story. The older sisters for example, who donated some garments to the store could have given much more humour to the story and the ladies in the bar could also have been made more of I think. I sometimes got a bit confused as to who was who and while the main characters were very well outlined, the sub characters were sometimes only half defined.